Projects in Projectopia can be added in one of three ways, which we’ll cover in this article. Firstly we’ll cover how to manually create a project. To create your first project, hover over the Projects link in the admin menu and select Projects, then click the New Project button on the right hand side. There is some information that needs to be collected in order for a project to be properly set-up. You’ll be directed to a modal window to enter this required information. Title – Enter a meaningful title for your project which will appear in the project list. Client & Client Contact – Choose a client and a client contact to assign the project to. If the client does not have additional contacts then the main contact will be selected automatically. Start / End Dates – These dates are required and will give the client information as to when the project will be executed. 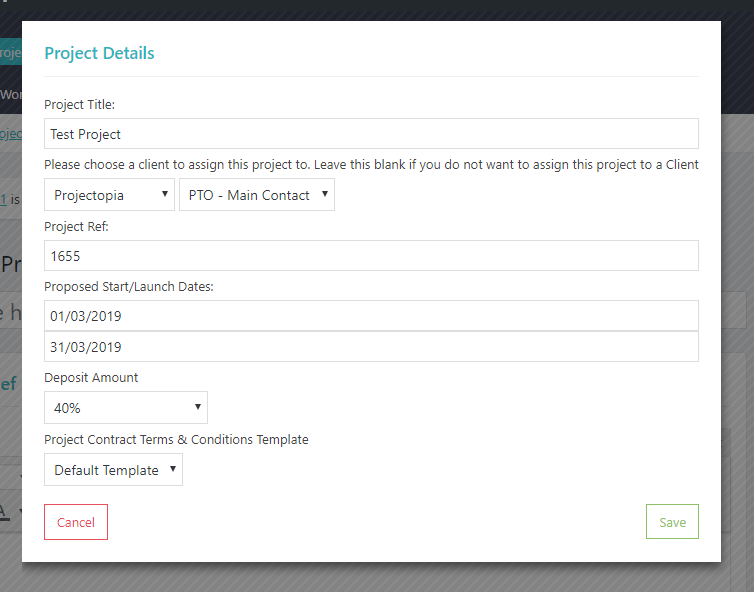 Project Terms & Conditions Template – Projectopia allows you to choose from multiple T&C templates for your project contracts. You can choose one here. This will be added to the contract of the project. See Contract Terms Templates and Project Contracts for more information. Projectopia allows you to convert Quotes to Projects manually if you wish. This is useful if you want to keep a record of quotes but do not want to have the requirement of a client having to accept the quote online. When a quote is manually converted to a project, data from the quote is passed over to the new project. This includes the client, start dates, milestones / tasks and the project brief. Once the quote has been converted it will be locked so that changes cannot be made to it. To manually convert a quote to a project, find the quote in the quotes admin page and open the quote. There is a “Convert to Project” button in the Quote Status column in the right sidebar. Clicking this will convert your quote to a project. The third method of creating a project is to do it automatically once a Quote has been accepted by a client. The end result of this process is largely the same as the Manual Quote Conversion function, but it requires a client to accept the quote. Please see Viewing / Accepting Quotes for more information on this feature.